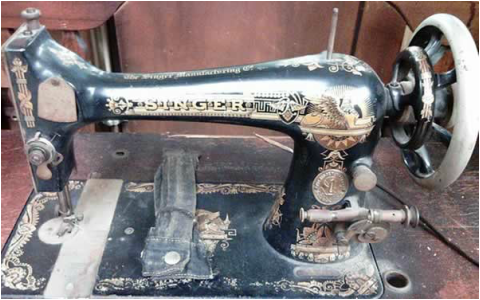 A mechanical sewing machine is the most basic of all three, and often is the least expensive to purchase. Changing from one type of stitch to another (for example from a straight stitch to a zig-zag), as well as changing the stitch length and width, are all done by manually turning dials on the machine. Also bringing the needle to the “needle up” or “needle down” position is done by manually turning the hand wheel. An electronic sewing machine is more of a “push button” operation for selecting stitches as well as their length and width. The needle in an electronic machine will automatically stop in either the “needle up” or the “needle down” position when you stop stitching. (Mechanical/manual machines can stop in “up”, “down” or anywhere in between). Electronic machines have a push button to change the needle position. Most electronic machines do not have a built in memory, so the stitch type and size will need to be reset each time the machine is turned back on. A computerised machine has a stitch memory that allows you to pick up where you left off on different projects. It also has a memory card (or stick, etc) that allows you to download stitches or embroidery designs from your computer, or the internet, and load them into your machine. A computerised machine can often be the most expensive to purchase of these three types of machines. Before you can begin to use your sewing machine, you will need to thread it properly, as well as thread and insert a bobbin. Now that your machine is threaded and the bobbin is loaded correctly you are ready to begin sewing. I suggest that you gather a few fabric scraps to practice with. This is the best way to get a feel of how your machine runs and how each different stitch looks. Be sure the control pedal is placed flat on the floor and the cord is free of tangles. Turn your machine on at the power switch. (If necessary see your owner’s manual to locate the switch). Note: Some very old sewing machines do not have an on/off switch. They are operational as soon as they are plugged in to an electrical outlet. The amount of stitches to choose from, depends on the type of machine you have. Some machines offer a small group of just the basic stitches; others have all the basic stitches plus many decorative stitches as well. Your sewing machine’s owner’s manual will give you a description (and probably a drawing) of each available stitch. It will also give the correct settings for the length and width for each type of stitch. Keep it handy as a reference guide when you first start sewing. I strongly suggest you try out each stitch on scrap fabric. This will give you a much clearer idea of what each one looks like. Very large stitches create a weaker seam than medium or smaller stitches. (But also remember that smaller stitches are more difficult to remove if you make a mistake). Experiment with different stitch lengths on some scrap fabric. Stitches that are too small can draw up the fabric so that it is difficult for the seam to lay flat. Ones that are too big can show gaps when the seam is stressed. Play around with different settings. Soon you will develop a feel for what is the best length for your project. In addition to regular stitches, most machines will also have stretch stitches for knit fabric. A knit fabric (for example tee shirt fabric) has more stretch to it than woven fabric. Therefore the stitches will need to stretch with the fabric as well. The straight stitch will probably be your most often used stitch when you first learn how to sew. (It is also the one most often used in the projects on this website). Your sewing machine works by continuously moving the needle in an up and down motion through the fabric. The top thread is joined with the bobbin thread to create the stitches. Remember - Before you start any new line of stitching, make sure the needle is in the UP, or highest, position. This will insure that the thread is not pulled out of the needle as you start to sew. If you forget and the thread pulls out - don’t stress. It's a very common mistake that beginners make. It’s annoying but no big deal. Just raise the needle to the highest point and re-thread it. Your next step is to place your fabric under the presser foot and line it up with the seam allowance markings on the metal plate. Your sewing pattern will tell you how wide your seam allowance needs to be. The fabric should also line up under the needle at the spot you want to begin the stitching. Lower the presser foot lever to hold the fabric in place. Lowering the presser foot holds your fabric in the correct position AND it also engages the tension on the thread. This tension allows the correct amount of thread to be pulled off the spool as you stitch. If you accidentally forget to lower the presser foot and begin to sew, you will soon have a big tangled mess of thread stitched into your fabric. Begin sewing by gently stepping on the foot pedal to start the machine. Practice this to see how different pressure on the pedal will increase or decrease the speed of the sewing machine. Go slow in the beginning until you get used to the feel of the machine. You do not need to push the fabric through the machine. It automatically moves along by the feed dogs under the fabric. You can, however, gently guide the fabric as it stitches, so that the right side edge stays lined up with your seam allowance marking on the metal plate. This will insure nice even seam allowances. When you are first learning how to use a sewing machine, it is best to keep it moving on the slower side till you get more used to it. You will also notice that when sewing a curved section it is easier to control the fabric at a slower speed. When you come to the end of your line of stitching, raise the needle to the “up” (highest) position. Cut the thread (top thread and bobbin thread) with either scissors or the thread cutter, if available, on the side of the machine. Sometimes it will be necessary to “lock in” your stitches at the beginning or end of a seam. This will insure that the first or last few stitches do not loosen up through wear and tear. If you have an electronic machine, chances are you have a lock stitch button. Press this button before you start your line of stitching, and the machine will automatically stitch in the same spot for several stitches before moving on to the rest of the seam. If you want to lock the stitch at the end of a seam, press the lock stitch button before you raise the presser foot, and press the foot pedal. The sewing machine will repeat a few stitches in the same spot to lock them in. If you have a mechanical machine (or your electronic machine does not have a lock stitch button) you can reinforce the seam at the beginning and end using your back stitch button or lever. Your sewing machine will move the fabric in reverse when you hold down your back stitch button or lever. This can be handy to stitch over the same area to reinforce or lock in the stitches. Practice on some scrap fabric until you get used to this feature.